Keith and Linda Offord are both zoology graduates, very experienced field ornithologists and have run countless wildlife watching holidays around the world. Together, they set up Wild Insights in 2004 and have operated a consistently sold-out UK and overseas programme with over 95% repeat bookings – a reflection of their consistent professionalism, care and attention. Arriving at Bandaranaike International Airport Columbo (Katunayake) at lunchtime, we then proceed by road to our first destination, Dambulla. We then check in to the hotel on Amaya Lake at Dambulla where two nights are spent. Amaya Lake, Dambulla, is set amidst the Cultural Triangle, (Sigiriya, Anuradhapura and Pollonaruwa) and the sumptuous grounds provide a rich mix of habitats to a wide range of bird species. Forming a scenic backdrop is the magnificent Kandalama Lake and the mist-shrouded mountains of the Sleeping Soldier. We will spend the day exploring the grounds where we may see Black-hooded Oriole, Alexandrine Parakeet, Tickell’s Blue Flycatcher, Lesser Goldenback, Orange-breasted Green Pigeon, Jerdon’s and Golden-fronted Leafbirds to name a few. After breakfast we visit The Temple of the Tooth, Sri Lanka’s most important Buddhist relic, then proceed to Nuwara Eliya stopping on the way at a tea plantation and factory and lunch. After checking in at our hotel we will make the short journey to Victoria Park where bird species include Forest Wagtail, Yellow-eared Bulbul, Indian Blue Robin, Pied Thrush, Indian Pitta, Kashmir Flycatcher, Sri Lanka White-eye and Dull Blue Flycatcher. Check in to the St. Andrews Hotel, Nuwara Eliya where two nights are spent. Today, after breakfast, we visit Horton Plains, a unique upland habitat. The specialities here include Sri Lanka Woodpigeon, Yellow-eared Bulbul, Pied Bush Chat, Sri Lanka Whistling Thrush, Sri Lanka Bush-warbler, Grey-headed Canary Flycatcher, Velvet-fronted Nuthatch, endemic Rhino-horned Lizard, Bear Monkey, Giant Squirrel and Sambar. This is also a great area for raptors including Oriental Honey-buzzard, Legge’s Hawk Eagle and Rufous-bellied Eagle. Packed lunch. Later in the afternoon, we return to Nuwara Eliya for further local birdwatching. After breakfast we have a full day jeep safari in Yala National Park with picnic lunch. One of the largest national parks in the country, the terrain at Yala is varied with grassy plains and forest, rocky scrubland, lagoons and a coastline. This multitude of environments supports a diverse range of animals and an abundance of birdlife including Spot-billed Pelican, Painted & Black-necked Storks, Lesser Adjutant plus an array of raptors and waders. Mammals include Asian Elephant, Sloth Bear, Mugger Crocodile, Spotted Deer, Sambar, Barking Deer, Wild Boar, Wild Buffalo, Golden Jackal. 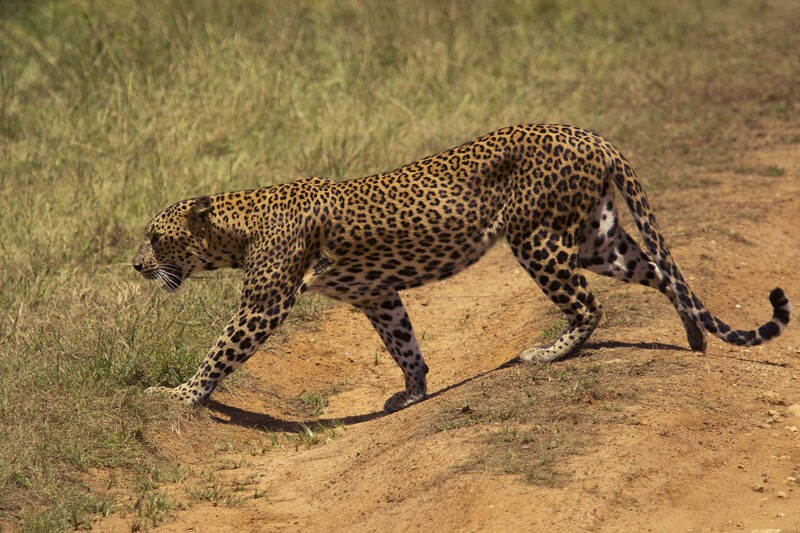 Yala also has one of the highest concentrations of Leopard in the world. After breakfast we return for another morning in Yala National Park. Then, after lunch at Cinnamon Wild we then proceed for another jeep safari to the nearby saltpans and lagoon. This is an excellent area for waterbirds such as Greater Flamingo, Western Reef Egret, Garganey, Great Thick-knee, Pacific Golden Plover, Little Ringed, Kentish, Lesser and Greater Sand Plovers, Marsh, Wood, Terek and Curlew sandpipers, Little Stint, a wide range of terns and Brown-headed Gull. After breakfast we proceed to Uda Walawe National park, arriving in time for lunch. We then take a jeep safari into the park, looking out for Spot-billed Pelican, Oriental Darter, Lesser Adjutant, Montagu’s and Pied Harrier, Crested Hawk Eagle, Grey-headed Fish Eagle, Barred Buttonquail, Plum-headed Parakeet, Blue-faced and Sirkeer Malkohas and Malabar Pied Hornbill. We also have a good chance of mammals such as Toque Monkey, Grey Langur, Golden Jackal, Spotted Deer and Water Buffalo and of course Asian Elephant for which the park is well-known. One night at Centauria Wild Udawalawe. After breakfast we proceed to Sinharaja, stopping en route at good birding areas. Sinharaja is in the wet area of Sri lanka and is one of the most important remaining areas of rain forest – home to a wide range of species, many of which are endemic. Check in to the Rain Forest Edge Boutique Hotel in Sinharaja where two nights are spent. After breakfast full day visit to Sinharaja Forest Reserve which is of international significance and has been designated a Biosphere Reserve and World Heritage Site by UNESCO. Included in the species we may see are Oriental honey-buzzard, Rufous-bellied Eagle, Shikra, Crested Serpent Eagle, Black Eagle, Chestnut-winged Cuckoo, Chestnut-backed Owlet, Lesser Hill Myna, Green-billed coucal , Lesser Yellownape, Sri Lanka Blue Magpie, Yellow-fronted Barbet, Red faced Malkoha, Ashy-headed Laughing-thrush and Spot-winged thrush. Packed lunch and dinner at the Rain Forest Edge Boutique Hotel. After breakfast, birding local areas and raptor-watching from terrace followed by lunch at Rain Forest Edge Boutique hotel. We then proceed north west, by-passing Columbo towards the international airport and check in to the Gateway Hotel Airport Garden in Katunayake where one night is spent. After breakfast and some last birding in the garden we proceed to airport for lunchtime flight to London Heathrow. After breakfast birding around Sinharaja rain forest followed by lunch in Rain Forest Edge Boutique hotel After lunch depart by air-conditioned minibus or coach to Marissa and check in to the Mandara Hotel where one night is spent. Lunch and dinner at Mandara Hotel. All morning whale watching by boat with picnic breakfast. This trip provides a fantastic opportunity to see the mighty Blue Whale – the largest mammal on earth as well as a variety of other whale species, Spinner Dolphins and Flying Fish. This trip will of course be weather dependent. After lunch at the hotel depart by air-conditioned minibus or coach, by-passing Columbo towards the international airport and check in to the Gateway Hotel Airport Garden in Katunayake where one night is spent.